Mets Blogger Roundtable: Should Beltran’s Number Have Been Re-Issued? The New York Mets organization has been quite reticent to retire their best player’s jersey numbers. From a player perspective, hat is an honor which has been bestowed upon just Tom Seaver and Mike Piazza, two players who just so happen to be Hall of Famers who have worn a Mets cap on their Hall of Fame plaque. With respect to Piazza, once he departed via free agency, the team did not reissue his No. 31. Instead, like what we now see with Gary Carter‘s No. 8 and Keith Hernandez‘s No. 17, the number was taken out of circulation. Unlike Carter and Hernandez, the Mets retired Piazza’s number. What is interesting is Carlos Beltran is seen by most as a sure fire Hall of Famer, and it is eminently possible he enters the Hall wearing a Mets cap. Given precedent, you would think the number would be reserved for future retirement. Instead, it has been reissued to Val Pascucci, Fred Lewis, Travis d’Arnaud, Bob Geren, Matt Reynolds, and finally Luis Guillorme. No uniform number discussion is important to me until 8 goes on the wall. I could go either way about retiring Beltran’s number but have to agree with Metstradamus’ excellent point. Let’s wait for 8. I’m wishy washy on this subject regarding Beltran. He is the best center fielder they ever had, and easily among the top 10 players they’ve ever had. But he doesn’t identify with the base that way – people connect Beltran with that Adam Wainwright curveball in 2006. So if the Mets were to unofficially retire Beltran’s number by no longer issuing it, that could generate a negative discussion which, to be honest is avoidable and unnecessary. The team knows that and is obviously very sensitive to negative press and discussions, so it might actually be best to remain at a status quo on this. But ask me tomorrow and I might feel a bit different. As great as Beltran was as a Met, the only way it’ll be taken out of circulation is if he goes into the Hall of Fame with a Mets cap on his plaque. Keith Hernandez was a team captain and, like Beltran, was a top hitter and fielder. But his No. 17 was given to the likes of Graeme Lloyd and Jose Lima. If Hernandez, who was more beloved as a Met than Beltran ever was, can’t get his number out of circulation, then Beltran won’t either. Let’s keep getting some use out of 15. Maybe Luis Guillorme will make us want to retire it twice. As much as I loved watching Beltran with the Mets and the countless times I’ve defended him for looking at strike one, two, and three in Game 7 (three of the nastiest pitches I’ve ever seen to this day), I personally do not retire his 15 or even take it out of circulation. When he gets into Cooperstown, which he will, if they stick a Mets hat on his head, I think at that point they have to retire it. Until then, if it were up to me, I say no.. He was successful everywhere else he went. That’s hallowed ground for this organization. Until David Wright‘s #5 gets a spot up there, no one else from that era should. Yes. Carlos Beltran is very deserving of this honor. Beltran from 2005-2011 hit .282/.369/.508 with a 130 OPS+. To put this into perspective, Mike Piazza hit .289/.367/.534 with a 133 OPS+ from 1999-2005. Also add on that Beltran was an elite defensive CF during most of his Mets career. Beltran seems quite likely to enter the Hall-of-Fame as a Met. 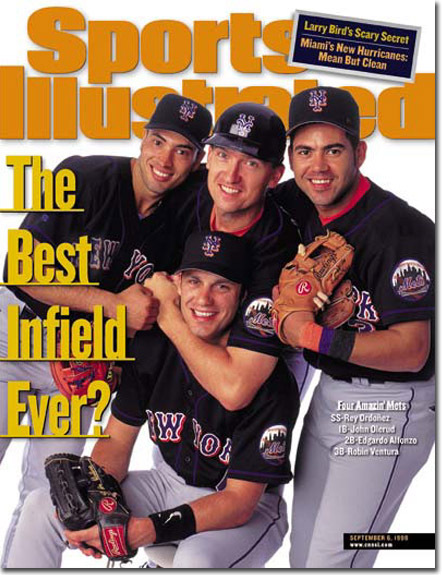 Beltran is an all-time Met and deserves the respect that the others before him have received. The Mets retire very few numbers and there is no reason Carlos Beltran shouldn’t be next along with David Wright. There has been some tension with the Mets and their fans against Carlos Beltran the few years. But fans have started to realize how great and impactful of a player he was and hopefully the Mets do too. The biggest issue with the Mets not taking out of circulation is like many things with the Wilpon family, it has the stench of being personal. It’s why we saw the team have a patch for Rusty Staub but not former owner Nelson Doubleday, a man who owned the team during the franchise’s greatest run. The decision reeks of pettiness related to Beltran striking out in the 2006 NLCS and for his going against team advice to have career saving knee surgery. Honestly, I’m not sure the team ever considered taking his number out of circulation, and if the topic was raised, it was quickly dismissed. When Beltran does get inducted ino the Hall of Fame, I seriously doubt we see the Mets replicate the Yankees efforts to heal old wounds like we saw when Dave Winfield was inducted, and in the event Beltran does opt to wear a Mets cap on his Hall of Fame plaque, part of me doubts the Mets take the next step in deciding to retire his number. One thing I don’t doubt is the terrific writing from the people who participate in this Roundtable. I encourage you to take the time to read what they’ve written about Beltran, Carter, and a host of all other Mets topics. While being a Mets fan may come with some trials and tribulations, the one day Mets fans are typically happy is Opening Day. Heading into today’s game, the Mets were 36-20 all time on Opening Day, which is the best Opening Day winning percentage in Major League history. As a result, the Mets are usually 1-0, and their manager looks like a genius. Today, new Mets Manager Mickey Callaway looked like a genius. When you looked at the Opening Day lineup, you knew immediately this was no longer Terry Collins‘ Mets. The lineup not only had the Mets best hitter, Yoenis Cespedes, batting second, it also had Noah Syndergaard batting eighth and Amed Rosario batting ninth. If you were skeptical of the decision, the Mets quickly put you at ease. Kevin Plawecki reached on a one out walk, and he remained there after Syndergaard struck out. With two outs and the lead-off hitter behind him, Cardinals starter Carlos Martinez challenged Rosario with fastballs. Rosario shot a single up the middle putting runners one first and second with two outs. Brandon Nimmo did what Brandon Nimmo does, and he drew a walk. Cespedes came up with the bases loaded, and he delivered with a two out RBI single, which at the time gave the Mets a 3-2 lead. And with that, Callaway looked like a genius. Frankly, it’s easy to look like a genius when everyone plays as well as the Mets did today. Nimmo set the tone getting hit by the first pitch of the game and eventually scoring on a Jose Martinez throwing error on what could have been an Asdrubal Cabrera double play grounder. Instead of an inning ending double play, the Mets scored a first inning run without getting a base hit. That’s what happens when you draw nine walks in the game. Speaking of Nimmo, he was brilliant today. He went 2-3 with two runs, a walk, and the aforementioned hit by pitch. With Michael Conforto reportedly being much closer to being ready to start his season, Nimmo is going to need more games like this to stay in the starting lineup. So will Adrian Gonzalez. The veteran was coming off a horrific injury plagued 2017 season where the Dodgers not only didn’t miss him as they won the pennant, it seemed they didn’t even want him around. Nor did the Braves for that matter, as after a trade, they are paying him almost $22 million to play for an NL East rival. Between that, his terrible Spring Training, and his soft line out to short in his first at-bat, helooked done. He wouldn’t make another out on the game going 2-3 with a run, double, two walks, and an RBI. In situations like this, you want your players to make the decision about who should sit and who should play to be extraordinarily difficult. Based on Nimmo’s and Gonzalez’s play, Callaway’s decision will just be that. Overall, the Mets offense and unconventional lineup was humming. The team scored nine runs on 12 hits highlighted by a five run fifth where they not only chased Martinez, but also former Mets prospect Matthew Bowman. Every Mets starter, save Syndergaard, reached base at least once safely. Cespedes and Rosario were the only ones who did not draw a walk. However, when Rosario is attacking first pitch fastballs to the tune of a 2-4 day with two runs and two RBI, you don’t mind his over-aggressiveness at the plate. About the only negative on the day was seeing Yadier Molina homer. That just brought back too many raw emotions from 2006. Some of that sting was taken away with Molina suffering the indignity of Jay Bruce stealing a base off of him. With Syndergaard, you had some real reason for excitement. He became just the second Mets pitcher to strike out 10 on Opening Day. He needed just 85 pitches to get through six innings. Yes, he would give up the two homers, but overall, he seemed poised and ready to have a dominating 2018 season. Speaking of dominating, the Mets bullpen came out and completely shut the door on the Cardinals. Robert Gsellman, Anthony Swarzak, and Jeurys Familia combined to pitch three scoreless and hitless innings. Gsellman was the most impressive striking out the side in the seventh. This bullpen performance will make you forget about the Cardinals getting Greg Holland over the Mets for one day. And for this one day, Gonzalez is rejuvenated, the bullpen is lights out, Callaway is a genuis, and the Mets are the best team in baseball. Sure, it seems that way almost every Opening Day as a Mets fan, but at least for tonight, let’s just believe this will carry on well into October. Game Notes: A number 10 was placed on the back of the mound to honor the recently deceased Rusty Staub. Syndergaard joined Pedro Martinez as the only Mets starter to have a double digit strikeout game on Opening Day. This was the first time a Mets starter made back-to-back Opening Day starts since Johan Santana did it from 2008 – 2010. What Rusty didn’t know and couldn’t know because of the strike was part of the reason Hodges was so nice to him was the Mets had swung a trade the night before to obtain the larger than life right fielder. What Rusty didn’t know and couldn’t know at the time was this was the last time he would ever talk with Hodges. Tragically, without any warning, Hodges would die the next day. Like many Mets fans and players, Rusty never got to say good-bye. Rather, he was just left with the warm memories of a Mets great believing it was Easter Sunday that brought the best out in a fierce competitor. If you excuse the sacrilege of a former altar boy for a moment, maybe it wasn’t Easter Sunday which brought out the best in Hodges, maybe it was Rusty. While the City of Montreal may claim Rusty, he was definitively a Met. Considering the larger than life figure he was, I’m sure we will hear the Astros and Tigers fans claim Rusty as their own. That’s what happens when you have a player who is both great on the field and great off of it. Personally, I never knew Rusty from his playing days. I was too young to remember him and his 1985 season where he did nothing but pinch hit. Really, the only thing I know of Rusty as Met is the exploits which were touted during the videos on Diamondvision played during rain delays or the tales my father would tell me about how great he was in the 1973 World Series. No, I remember Rusty as a great Mets ambassador. The advertisements for his charity events for the New York Police & Fire Widows & Children’s Benefit Fund. Hearing about the fundraisers for the event was a big part of the season for a Mets fan. Contributing to it was all the more so. Considering this being his post-retirement’s life’s work, his tireless efforts after 9/11 should come as no surprise. I also remember the broadcasts. Back when Rusty was calling games, he and Ralph Kiner were one of the reasons you tuned in. Sure, they tended to be Mets homers, but you could excuse it a bit with the old stories and enthusiasm they had for the Mets. It was really no different than listening to your dad and uncles sitting around a table talking which watching a Mets game. Personally, my favorite Rusty memory was from a few years back. While on a plane from Ireland, Rusty suffered a heart attack. In a situation which would have killed nearly anyone, Rusty survived, and he lived to tell about it. More than than, he relished it, and if you’ve ever listened to him during a Mets game, you knew he could spin a tale. Those are the memories that we should all miss. For those who watched him play, I’m sure you will miss him all the more. And now, 46 years after he became a Met, he now leaves us. In a somewhat fitting and tragic fashion, he departs us during the Easter Triduum. After all he has done for the Mets and City of New York, he now rests peacefully. Hopefully, when we all think back upon his life, we will all recall how like Easter Sunday, Rusty brought out the best in all of us. During Spring Training, we saw that David Wright is still able to go out there and hit. Ultimately, it wasn’t his ability at the plate that caused the Mets to shut him down. It was his inability to throw a baseball. There was a dark period where we thought it would never happen for him again. Recently, there was a glimmer of hope with him playing consecutive games at third base for St. Lucie. That hope faded away with Wright shutting down his rehab stint due to shoulder pain. Once again, there is doubt Wright can ever play in the field again. What is difficult here is there still may be baseball left in Wright. If nothing else, Wright has two years and $27 million to motivate him to return. But it’s more than money. Seeing Wright over the past 12 years, we see a determined player with a lot of pride. We also see a player who just loves playing baseball. Now, there is a reasonable belief Wright can still hit. Since 2015, Wright played in 75 games, he hit .260/.365/.436 with 15 doubles, 12 homers, and 31 RBI. During that stretch, he had a 119 OPS+ and a 125 wRC+. If the Mets were an American League team, Wright could be a viable option at DH. Looking at the current league leaders, if Wright could still replicate his 125 wRC+, he would rank third in that category among DHs. Whether or not his shoulder will permit him to do even that remains to be seen. What we do know is that he can’t do that with the Mets unless the team wants to give him the 1985 Rusty Staub treatment, which is something no team will do in the modern game. Realistically speaking, if there is going to be more baseball in Wright’s career, it’s not going to be with the Mets. If Wright is going to have a second act in his career, it is going to happen as a DH. We’ve seen with the Red Sox, they were more than happy to go with a hobbled David Ortiz as their DH. The Angels have done the same with Albert Pujols. While Wright doesn’t have their power, he still has the ability to hit. Unlike them, he still has the ability to run. Long story short, he still has ability. Now, there aren’t going to be teams lining up to take Wright. No one wants an injured 34 year old owed $27 million. However, teams may be willing to take a flyer if the Mets eat some or all of his contract. As we know the issue here is that is something the Mets are loathe to do. But they need to do it. Wright’s mere presence puts the team in a holding pattern. It’s led them to go with Eric Campbell as a backup in 2016, and it led to Jose Reyes being the Opening Day third baseman in 2017. The Mets simply cannot repeat this mistake. They need to fully address the position this offseason if they want any hopes of returning to the postseason. The team can’t do that as long as Wright is on the roster. As long as he is here, he is going to play in some capacity. That is a hindrance to both him at the Mets. The team needs a real answer at third, and he needs a real opportunity to play. For Wright, that is in the American League. There, anything is possible for him. He could play a full season. It’s possible he make the All Star team. There may be another postseason in his future. Maybe, he wins a World Series. If nothing else, Wright has his best chance to extend his career. Overall, there is no doubt the Mets and Mets fans love Wright. In the 55 year history of the Mets, there is perhaps no player that loved being a Mets player more than Wright. If they truly loved each other, they need to do what is best for one another. They need to move on. Once that happens, they will both be better off for it. You cannot tell the story of the New York Mets franchise without the Montreal Expos. The Expos first ever game was against the Mets on April 8, 1969 at Shea Stadium. It was not only the first game in Expos’ history, it was also the first game in what was the Mets path to winning the 1969 World Series. On October 3, 2004, the Expos would play their final game in their history at Shea Stadium. Between those two days on time so much had transpired. The first major trade between the two franchises was the Don Clendenon trade. Clendenon would become the power hitting first baseman the ’69 Mets needed to put them over the top. More importantly, Clendenon would go on to become the 1969 World Series MVP. After a few disappointing years, the Mets made a trade with the Expos again. The time the Mets obtained Le Grande Orange, Rusty Staub. Staub was a part of the “Ya Gotta Believe” Mets. Staub had an incredible postseason that year. He hit three homers in the NLCS when the Mets upset the Big Red Machine. He hit .423/.464/.615 in the World Series. Bum shoulder and all, he had a great World Series for a Mets team that came so close to upsetting the Athletics in the World Series. The Mets would not make the playoffs again until 1986. The missing piece to that team was Gary Carter, who the Mets obtained in a trade with the Expos. Carter was everything the Mets thought they were getting and more. He continued putting up Hall of Fame numbers while nurturing a young Mets pitching staff. However, what Mets fans will remember him most for was getting the two out rally started in Game Six. The Mets would not acquire anything of value from the Expos until right after the Expos were no more. The Mets hired Expos GM Omar Minaya. Minaya would assemble the 2006 team that nearly went to the World Series. He also built a strong farm system that would eventually help the Mets return to the World Series. It’s funny to think that Minaya’s big move with the Expos was trading for Bartolo Colon. With Macier Izturis announcing his retirement, Colon is now the last player to ever wear a Montreal Expos uniform to be active in the Major Leagues. Colon, who was a key member of last year’s pennant winning team, returned to the Mets. With Colon turning 43 this year, it’s possible he can end his career with the Mets. It would be fitting that the Mets once again close the door on the Expos franchise. When that door is finally closed, both fan bases will have shared memories of players like Staub and Carter. Both players were beloved by both franchises. It was players like this that will forever link both franchises. Unfortunately, the Expos are gone to the detriment of Expos fans, Mets fans, and all of baseball.